Here is an Electronic Circuit Project of 9 Bit cmos converter, simple and low-cost this circuit. 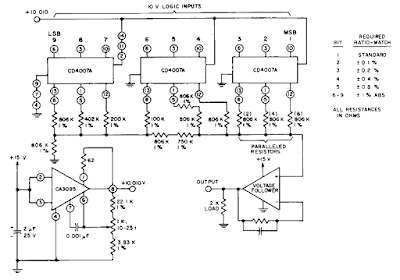 Three CD4007 A IC packages perform the switch function using a 10-V logic level. A single 15-V supply provides a positive bus for the follower amplifier and feeds the CA3085 voltage regulator. The scale adjust function is provided by the regulator output control, which is set to a nominal10 V in this system. The line-voltage regulation (approximately 0.2%) permits 9-bit accuracy to be maintained with a variation of several volts in the supply. System power consumption ranges between 70 and 200 mW; a major portion is dissipated in the load resistor and op amp. The regulated supply provides a maximum current of 440 p,A of which 370 p,A flows through the scale adjusting. The resistor ladder is composed of 1 % tolerance metaloxide film resistors. The ratio match between resistance values is in the order of 2%. 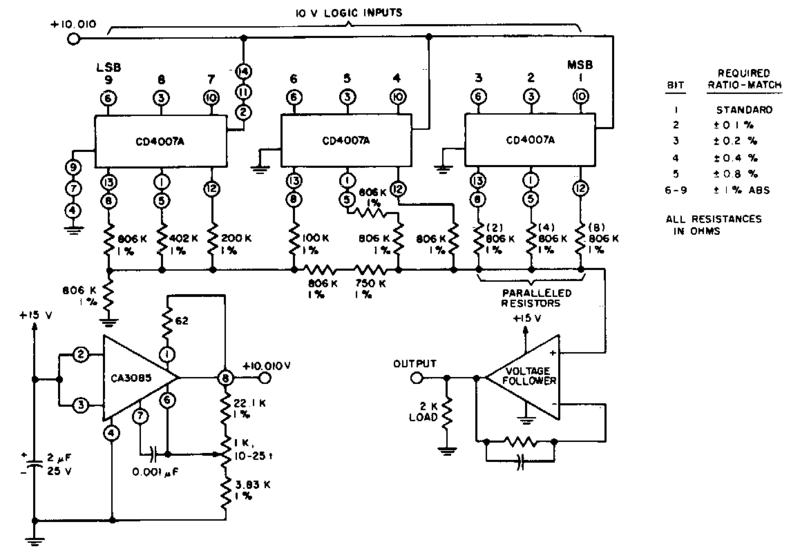 The follower ampliiier has the offset adjustment nulled at approximately a 1 V output level.